The 1993 Bow Wow was held in Dallas, Texas on the Memorial Day weekend. 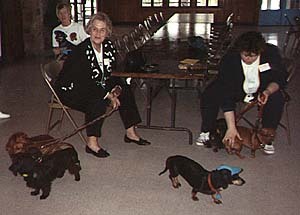 Organized by Diane Combs, the Dallas Bow Wow was the inaugural National Bow Wow (there were mini-Bow Wows before this) and has started a tradition that continues today. 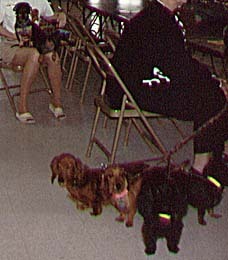 Approximtely 40 people and their dogs attended this event and participated in events such as Doxie Bingo, DC crossword puzzle (complete with a prize mug misspelling DACHSUND! ), and find the missing "H". 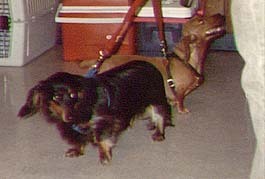 There were some Rescue adoptions as well as Kathy Kuddes melted at the sight of Pearl and Bill Whitaker took Niki to a loving home in Florida.